May | 2012 | What about this? The courtship . . . The ring . . . The dress . . .
May you have many more unforgettable moments! Looking for a special and unique card for a bridal shower or a wedding? Why not make your own? 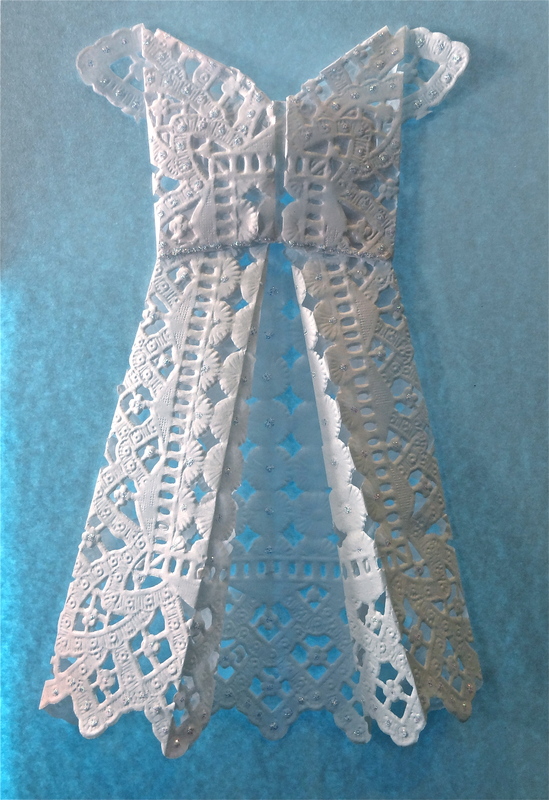 Using a paper doily and following the easy directions for an origami paper dress in a You Tube video, I created an origami wedding dress card for my future daughter-in-law’s bridal shower. 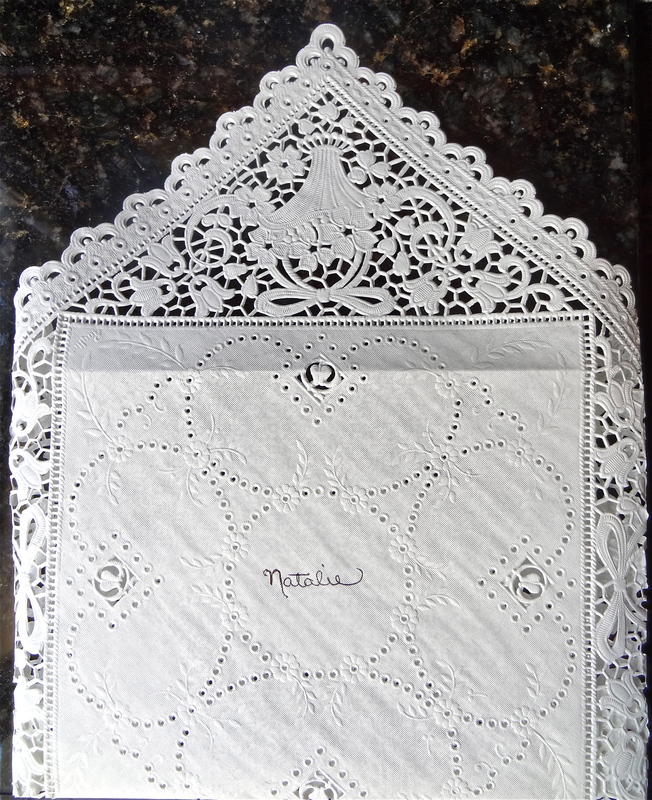 I also fashioned an envelope for the card by using a large square doily. By using any paper with a small print, you can create cute dresses for use on other cards for different occasions, too! 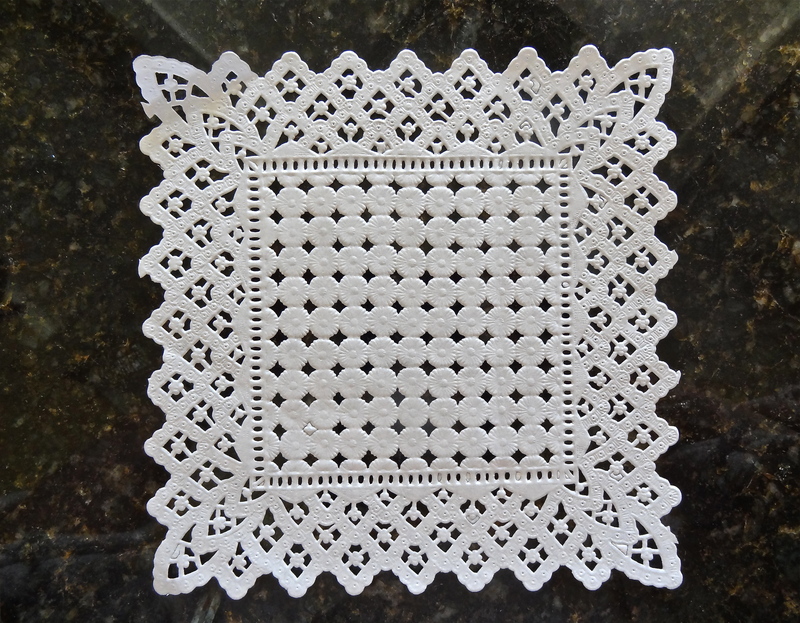 If you cannot find square doilies, you can always attempt to cut a round doily down to a square. 2. On the back of the folded dress, glue down strategic areas to keep the dress together and let dry. 3. Add a little sparkle to the dress by using glitter glue or self-adhesive rhinestones. Let dry. 4. 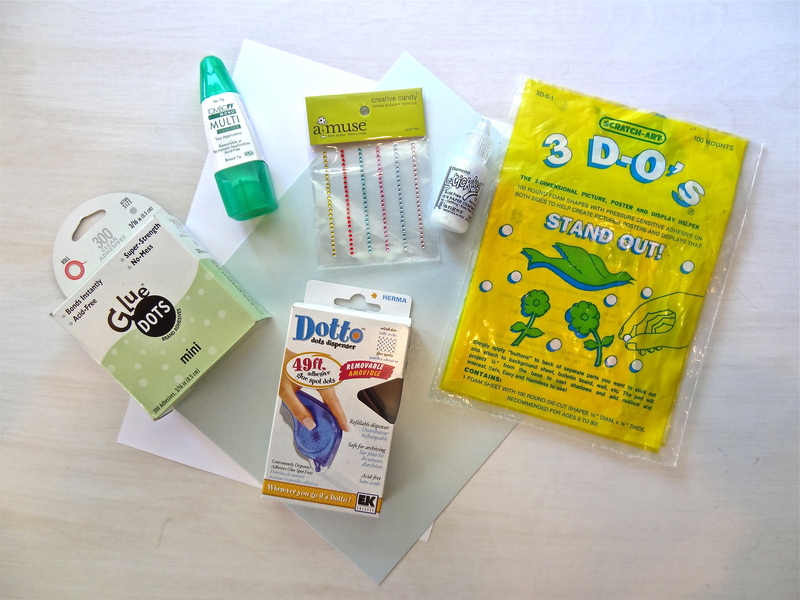 Using sticky dots, adhere dress carefully to the front of a piece of scored and folded card stock. Glue can be used here instead, but I find that sticky dots are more efficient because there is no drying time involved and they adhere well to metallic or pearlized paper. 5. If desired, apply pop-up dots underneath the dress in key areas to help the dress keep its three-dimensional form. 6. Either use the sentiment I used above or select your own. Print it up and trim it to fit the interior of the card. Adhere it to the inside of the card. 1. 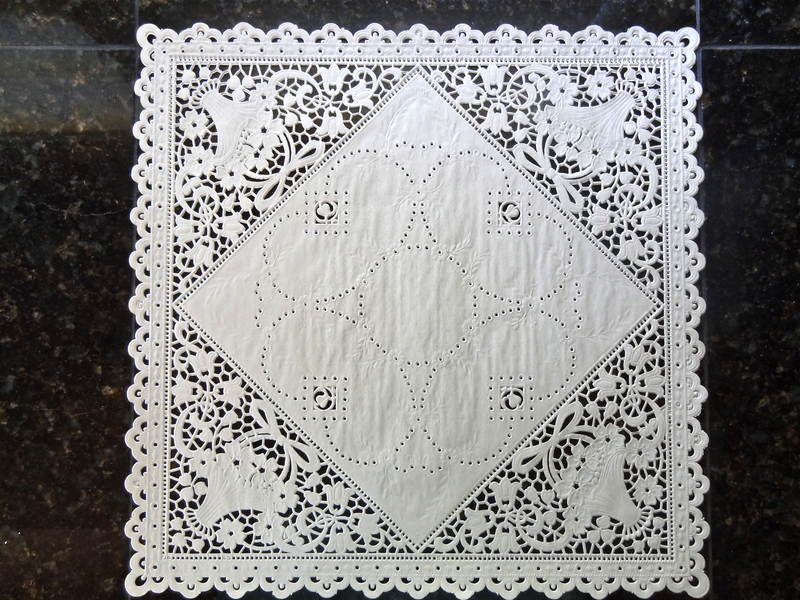 Using another card or piece of paper the same size as the wedding dress card, center it in the middle of the large doily and fold all four sides down around it like a diaper: fold bottom flap up first, fold in the two sides, and then fold the top flap down. 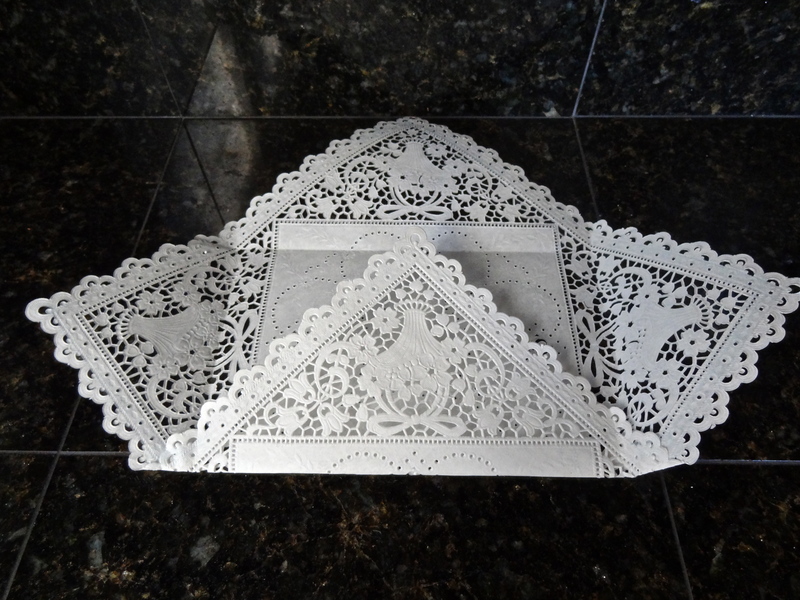 It is important to use another card the same size or else your pretty paper dress card can be damaged during the process of folding and gluing the envelope. 2. Open up the flaps and carefully apply glue to the inside edges of the lower portions of the two side flaps. Press them down to adhere them to the bottom flap. 3. Apply repositional glue to the edges of the top flap. Reposistional glue is advised here, so that the envelope can be opened and closed repeatedly. 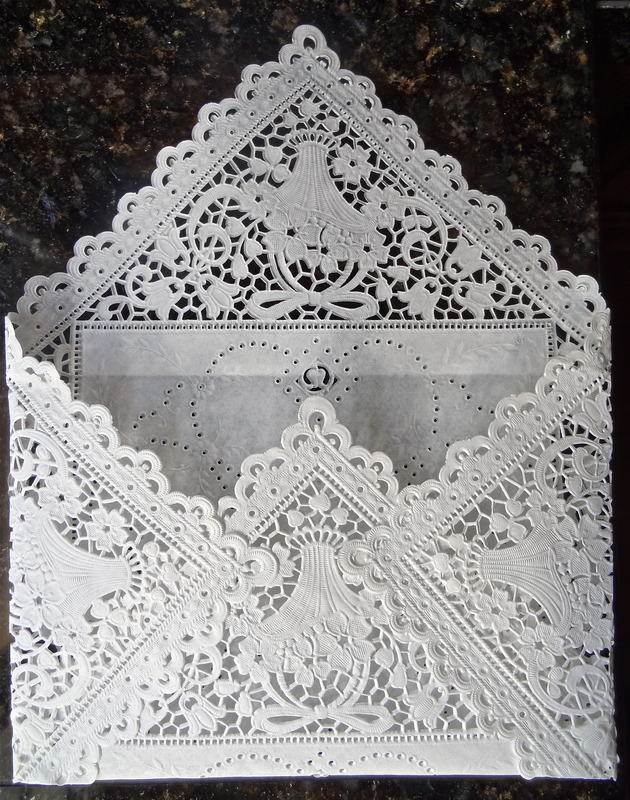 If using a permanent-type glue, there is a chance the delicate doily will tear upon opening. 4. Remove the dummy card and insert the real card. Fold the top flap down and press to adhere. Have fun designing dresses and making cards! ♥ Hummingbirds are the tiniest birds in the world and they are also the smallest of all animals that have a backbone. ♥ Because hummingbirds can rotate their wings in a circle, they are the only birds that can fly forwards, backwards, up, down, sideways and hover in mid air. 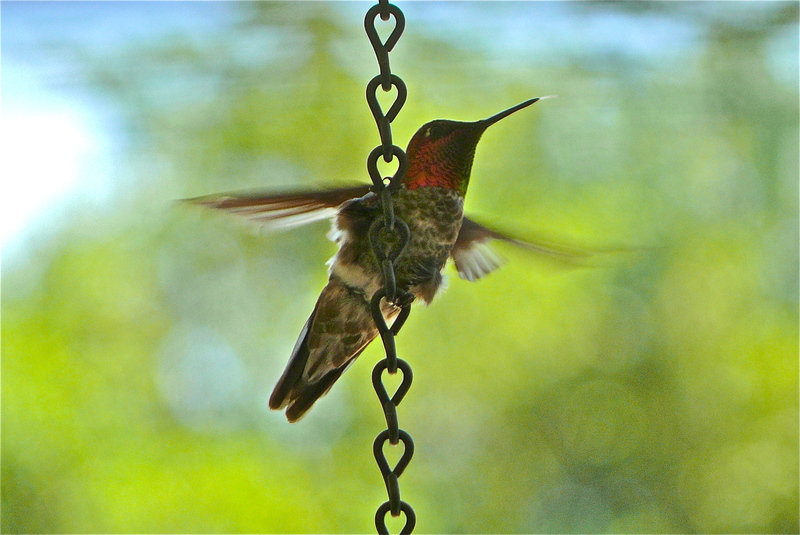 ♥ The bright flashing-colored feathers of the hummingbird’s neck is called a Gorget. ♥ A hummingbird’s brain is 4.2% of its body weight, the largest proportion in the bird kingdom. ♥ Hummingbirds are very smart and they can remember every flower they have been to, and how long it will take a flower to refill. ♥ Hummingbirds can hear better and see farther than humans, but they have nearly no sense of smell. ♥ A hummingbird’s heart beats up to 1,260 times per minute. ♥ A hummingbird baby is generally smaller than a penny. ♥ Most hummingbirds die in the first year of life, but those that survive have an average life span of 5 years. ♥ Hummingbirds are very territorial and will perch in trees, vines or bushes, between feedings to watch the area . . . and will attack other birds that might try to feed at their food source. In another inspirational video from TED, activist Caroline Casey “tells the story of her extraordinary life” and “asks us all to move beyond the limits we may think we have.” Worth watching. 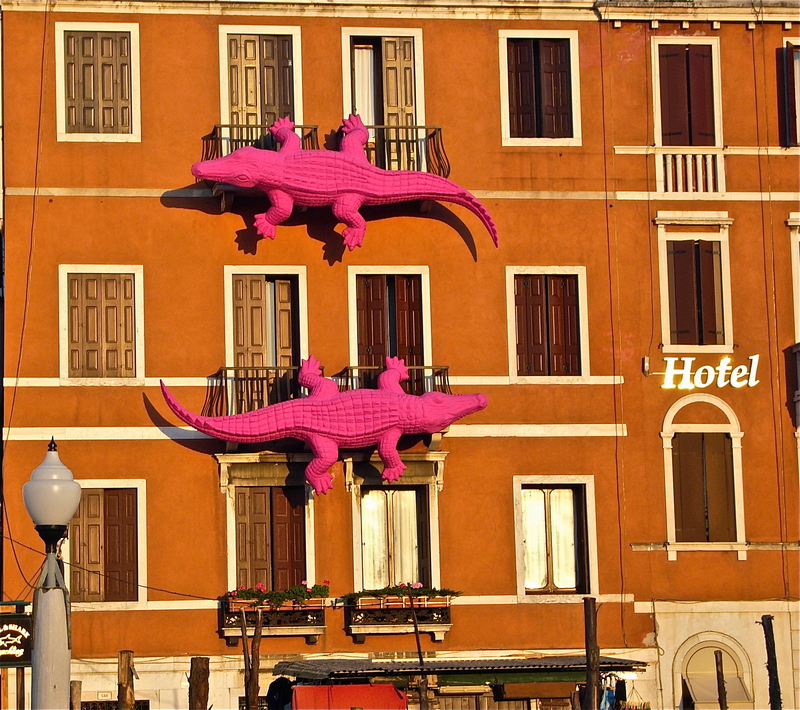 This repurposing idea from Brian Jewett is beyond clever. 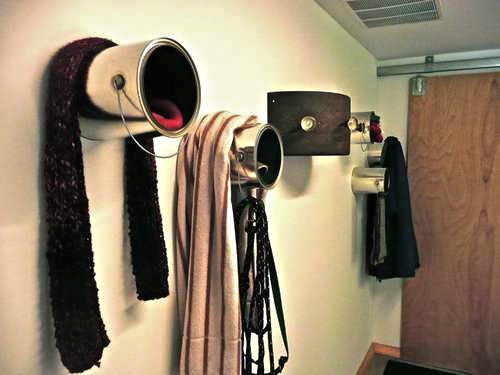 By attaching cleaned paint cans to a wall, he creates multipurpose hooks. A garment can be hung over the can, stuff can be stored in the can (I’m thinking keys), and something, like a scarf, can be hung on the can’s handle! Directions for this project can be found on Instructables. These can hooks would look great in a garage, an artist’s workshop, a child’s bedroom or playroom, etc.! 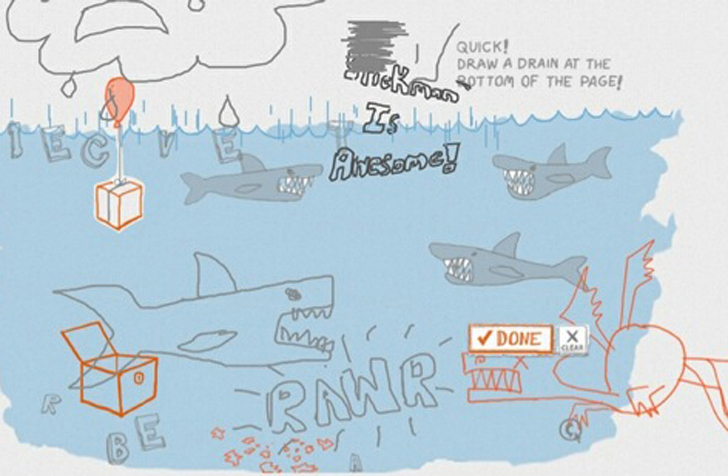 There’s no end to creative ideas! The talented combination of Sheldon Neill and Colin Delahanty, two young videographers, brings us this under-four-minute incredibly beautiful video of Yosemite National Park. Yosemite HD, a high definition, time lapse video, depicts the majesty of nature. Even if you’ve seen Yosemite with your own eyes, you’ll still want to see it through their eyes! 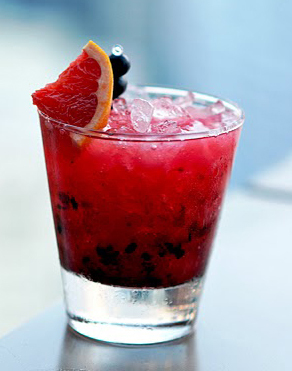 Enjoy every moment of your weekend! My husband will wonder if I’m throwing an impromptu party when he finds a container of freshly stuffed mushrooms and cherry tomatoes in our refrigerator. Yes, I’m having a party, but just a party for one! With only two months left before my son’s wedding, I would still like to lose some weight. 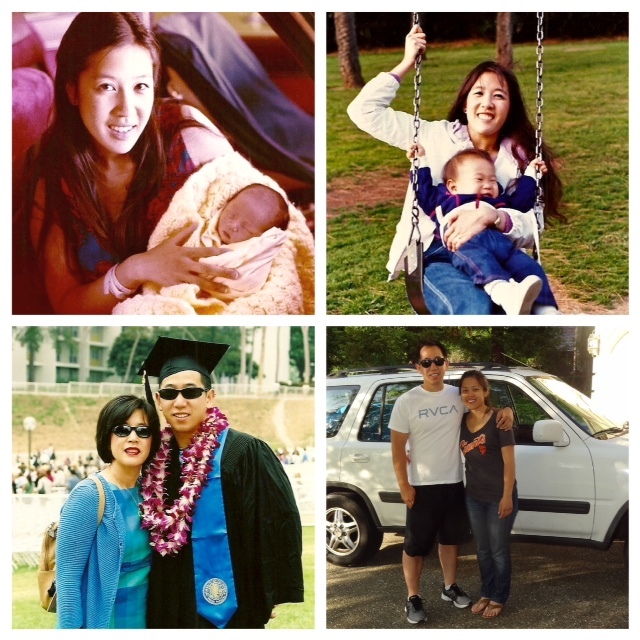 Since my son became engaged, my husband has managed to lose over twenty pounds. What about me? Well, despite the fact, that I eat a small-portioned, healthy diet and work in a mix of cardio and strength training on a regular basis, I’ve not lost a single pound! My trainer tells me not to fret, since I have lost inches and body fat. So what about the appetizers in my refrigerator? Other than at the gym, I hate repetition. Bored with the usual snacks of apples, celery, and carrots, I decided to reward my progress with some healthy gourmet snacks! 1. Rinse the tomatoes and set aside. 2. Also wash and set aside 24 small basil leaves and chop remaining basil. 3. Cut 12 tomatoes in half, squeeze out all the seeds and juice, dice and set aside. 4. In a food processor or blender, puree the beans, basil, garlic oil and lemon juice until it reaches a finely chopped consistency. 5. Place pureed bean mixture in a medium bowl. Stir in the chopped tomatoes and chopped basil. 6. Remove top 1/4 portion from remaining 24 tomatoes and discard. 7. 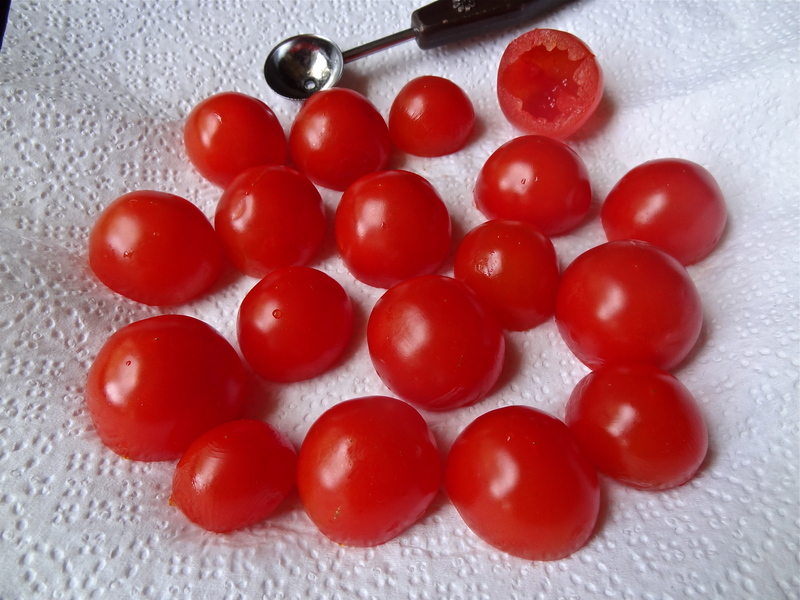 Slightly squeeze out the seeds, liquid and pulp using a small spoon, so you can create a cavity within the tomatoes. 8. Fill tomatoes with the bean mixture. 9. 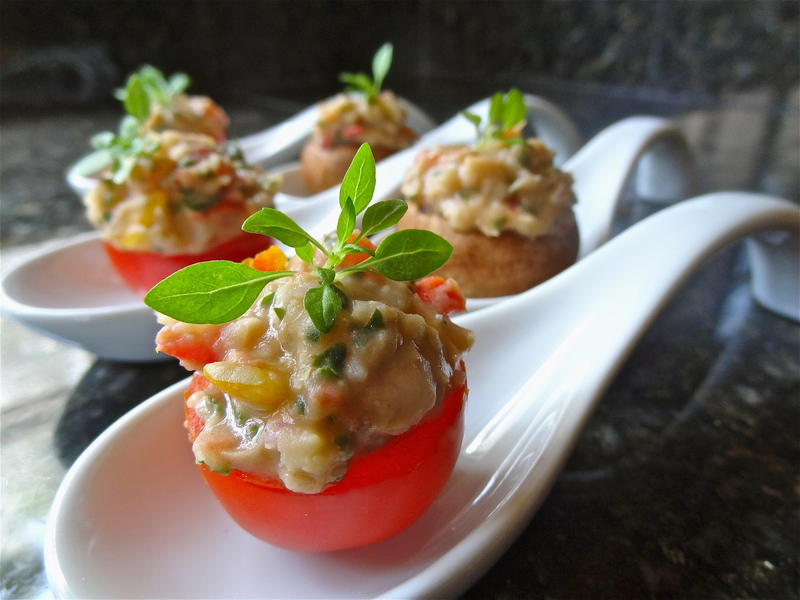 Garnish each tomato at the top with 1 basil leaf. 1. Having large ripe tomatoes sitting on my kitchen counter, I decided to dice those instead of the cherry tomatoes. 2. I used a little bit more lemon juice than called for, just to give it a fresher flavor. 3. I added half a shallot, a little salt and freshly ground pepper to the food processor before adding the beans. 4. You don’t want to over process this bean filling. It should still have small chunks of bean in it. 5. The recipe confusingly adds the basil twice – once to the food processor and then again to the pureed bean mixture. I ended up adding some to the food processor, and added in a bit more with the tomatoes. Although I love basil, I would probably not add as much the next time I make this recipe. 6. I did not discard the tomato tops as instructed in step 6. Instead, I diced them and added them to the bean mixture. I hate to waste food! 7. I used the small side of the melon baller to scoop out the tomatoes and then inverted the tomatoes on a paper towel to drain. A small demitasse spoon was used to fill the tomatoes and the mushrooms with bean filling. 8. Garnishing the tomatoes and the mushrooms in the photo are tiny Globe Basil branches from my garden. 9. The bean mixture is also delicious in baby bella mushrooms. 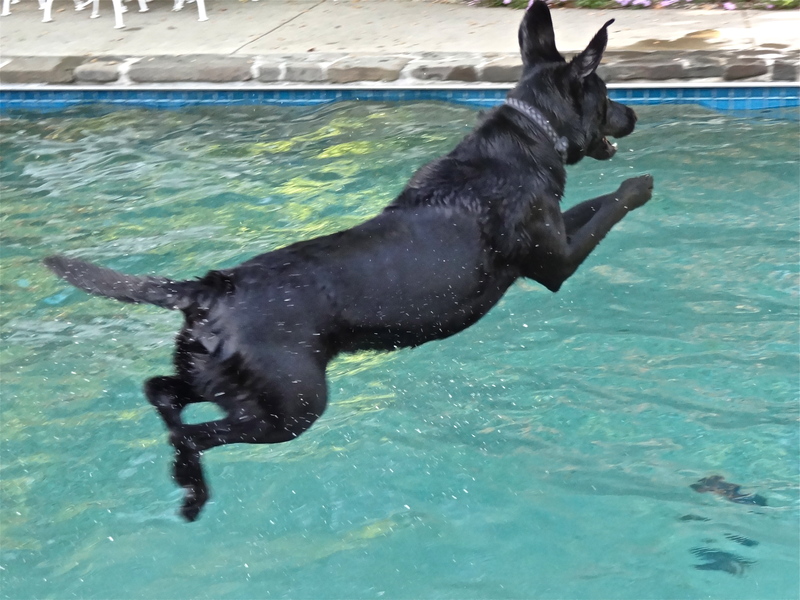 Running with unbridled joy, Buster, my “grand puppy,” leaps into the air and performs his signature belly-flop into the water. Quickly, he locates his float-toy, snatches it with his mouth, dog paddles back, drops the float on the ground, sprays water over everyone as he shakes it off, and then barks a resounding “Let’s do that again!” Sitting in the cool shade of a tree, I watch Buster repeat this series of actions for almost an hour. During this time, my thoughts shift from “dog hair clogging the pool filter” to “what a joy it is to live in the moment.” This is just another life lesson I’ve learned from a dog! #1 – Gelato or Ice Cream? 1. Gelato is made with mostly milk, whereas ice cream is made with mostly cream. Therefore, ice cream has 2-3 times the fat content. 2. 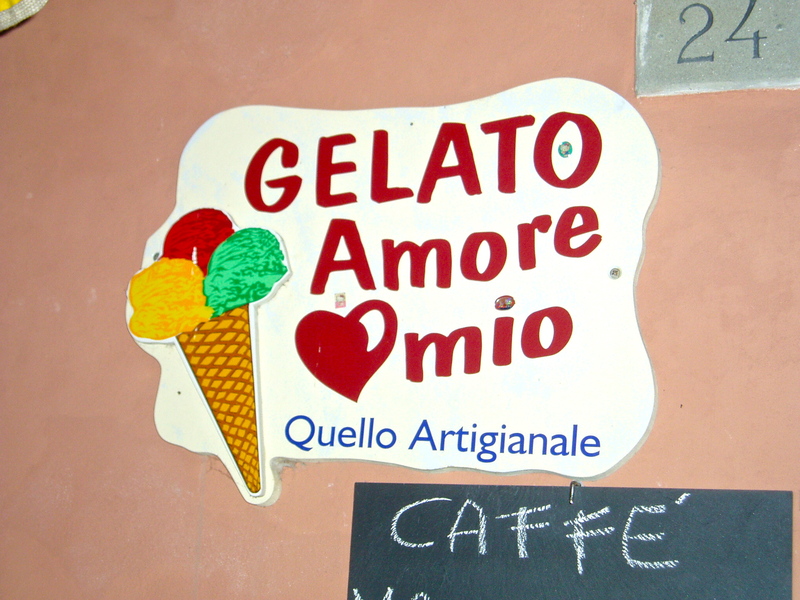 Gelato is made using a slow churning process, whereas ice cream is whipped. This means gelato has a lower air content making it denser and richer. 3. Gelato is served at a warmer temperature than ice cream, and freezes at a lower temperature, so it is soft from the first spoonful. During an NPR interview, Gretchen Reynolds, the New York Times PhysEd columnist, discusses the importance of standing up every two minutes of sitting. If you sit at a desk for the better part of the day, you might want to read or listen to her interview as she details “simple ways you can combat the effects of a sedentary lifestyle” and other health and fitness issues. If recycling were made simpler, more people would do it. Storing recyclable items at home until enough accumulates to warrant a trip to a recycling center is a minor inconvenience compared to the problem of figuring out what is accepted and what is not accepted at recycling centers. The Daily Green’s helpful article, “What Do Recycling Symbols on Plastics Mean?” takes some of the mystery out of recycling plastic. 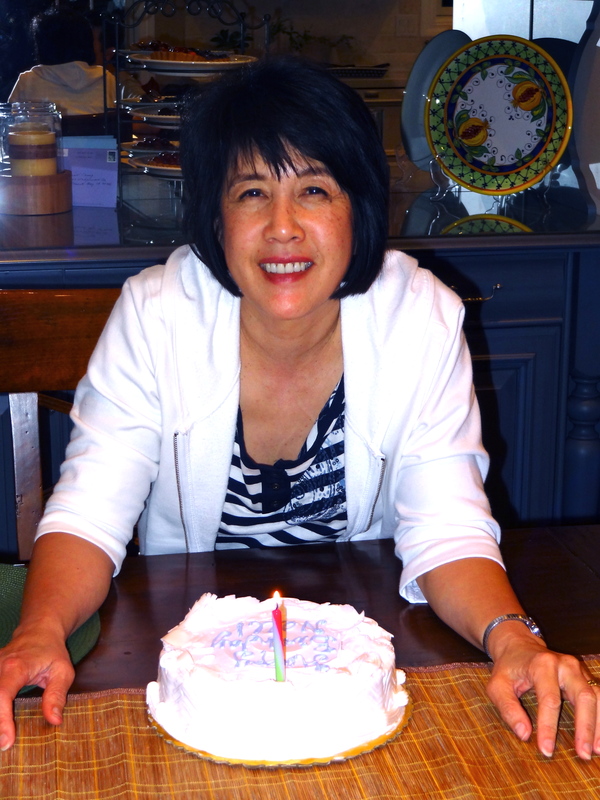 Enjoy your weekend and Happy Mother’s Day to all you moms!